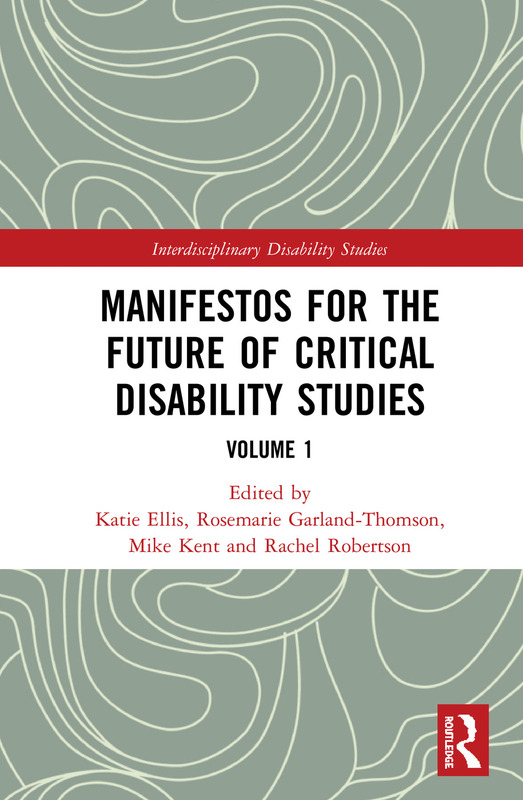 This collection identifies the key tensions and conflicts being debated within the field of critical disability studies and provides both an outline of the field in its current form and offers manifestos for its future direction. Traversing a number of disciplines from science and technology studies to maternal studies, the collection offers a transdisciplinary vision for the future of critical disability studies. Some common thematic concerns emerge across the book such as digital futures, the usefulness of anger, creativity, family as disability allies, intersectionality, ethics, eugenics, accessibility and interdisciplinarity. However, the contributors who write as either disabled people or allies do not proceed from a singular approach to disability, often reflecting different or even opposing positions on these issues. Containing contributions from established and new voices in disability studies outlining their own manifesto for the future of the field, this book will be of interest to all scholars and students working within the fields of disability studies, cultural studies, sociology, law, history and education. The concerns introduced here are further explored in its sister volume Interdisciplinary approaches to disability: looking towards the future. Katie Ellis is associate professor and senior research fellow in Internet studies at Curtin University. She holds an Australian Research Council Discovery Early Career Research award for a project on disability and digital televisions and is series editor of Routledge Research in Disability and Media Studies. Rosemarie Garland-Thomson is professor of English and bioethics at Emory University, where her fields of study are disability studies, American literature and culture, and feminist theory. Her work develops the field of critical disability studies in the health humanities, broadly understood, to bring forward disability access, inclusion and identity to communities inside and outside of the academy. Mike Kent is an associate professor and Head of School of Media, Creative Arts and Social Inquiry at Curtin University. Mike’s research focus is on people with disabilities and their use of, and access to, information technology and the Internet. His edited collection, with Katie Ellis, Disability and social media: global perspectives was published in 2017, as was their four-volume major works collection, Disability and the media: critical concepts in cultural and media studies. Disability studies has made great strides in exploring power and the body. This series extends the interdisciplinary dialogue between disability studies and other fields by asking how disability studies can influence a particular field. It will show how a deep engagement with disability studies changes our understanding of the following fields: sociology, literary studies, gender studies, bioethics, social work, law, education, or history. This ground-breaking series identifies both the practical and theoretical implications of such an interdisciplinary dialogue and challenges people in disability studies as well as other disciplinary fields to critically reflect on their professional praxis in terms of theory, practice, and methods.